How do the self-tie bow ties look when tied? Depending on how they are tied, self-tie bow ties will look different, so there isn't one particular way that they will look. It’s part of the charm of a self-tied bow tie that it can be either messy or perfect and it’s fine either way. The good news is that the pre-tied bow ties you see on our website have been designed and manufactured to look very similar to a self-tie bow tie, so you can rely on these photos to give you an idea of how it will look when tied. Why is the bow tie I want not available as a self-tie? Usually, our decision not to make a self-tie available is due to the nature of some fabrics and the manufacturing process, which make some fabrics unsuitable for self-tie. We also limit some of our bow ties, such as our flag bow ties, because they need to be folded in a very specific way in order to reflect the true image. However, it may also be that we have reached the last of the fabric or stock, and it simply isn't available any more. Why are some bow ties only available in some shapes? Unfortunately, some of our bow ties aren’t available in the full range of shapes we supply because the fabric or design doesn’t work well with these shapes. Can you make a kids bow tie for me? Absolutely. We have a range of children's bow ties already available on the website, but if you see a design that isn't available on the website, we should certainly be able to make one for you. Any bow ties that are made specifically for you and aren't for sale on the website will be treated as a custom-made product and will be non-returnable. Depending on the nature of the fabric or design, some styles may not be available or possible to make as a kids bow tie. Can you supply fabric samples ahead of placing my order? Of course! The beauty of your items being handmade to order is that we have fabric we can send to you ahead of placing your order. You can find the option for fabric samples on each product. If you need help ordering samples, please don’t hesitate to ask customer services. 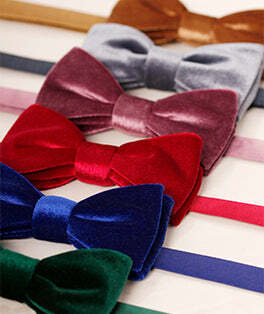 The majority of our bow ties are available either pre-tied (fixed to maintain their shape) or as self-ties.